Tool material should possess three main qualities, i.e. wear resistance, hot hardness (the ability of tool to withstand the high temperature without losing its cutting edge) and toughness. No tool material is yet known, which is equally good in wear resistance, toughness and hot hardness among the many tool materials. The following materials are commonly used for manufacturing the cutting tools. Selection of a particular material will depend on the type of service it is expected to perform. Plain carbon steel having a carbon percentage as high a 1.5% are in common use as tool material for general class of work. However, they are not considered suitable for tools used in production work because they are not able to withstand very high temperature, with the result, they cannot be employed at high speed. Usually the required hardness is lost by these tools as soon as the temperature rises to 2000- 2500 C. They are also not highly wear resistant. They are used mainly for hand tool especially for carpentry work. These tools are less costly, forged and can be easily heat treated. It is a special alloy steel which may contain the alloying elements like tungsten, Chromium, Vanadium, Cobalt and molybdenum etc up to 25%. These alloying elements increase its strength. Toughness, wear resistance, cutting ability and ability to retain its hardness at elevated temperature in range of 5500C to 6000C. Due to these added properties the high speed steel tools are capable of operating safely at 2 to 3 times higher cutting speed than those of high carbon steel tools. The most commonly used high speed steel is better known by its composition of alloying elements in the ratio of 18:4:1, i.e. 18% Tungsten, 4% Chromium and 1% Vanadium. It is highly wear resistant and carries high hot hardness. 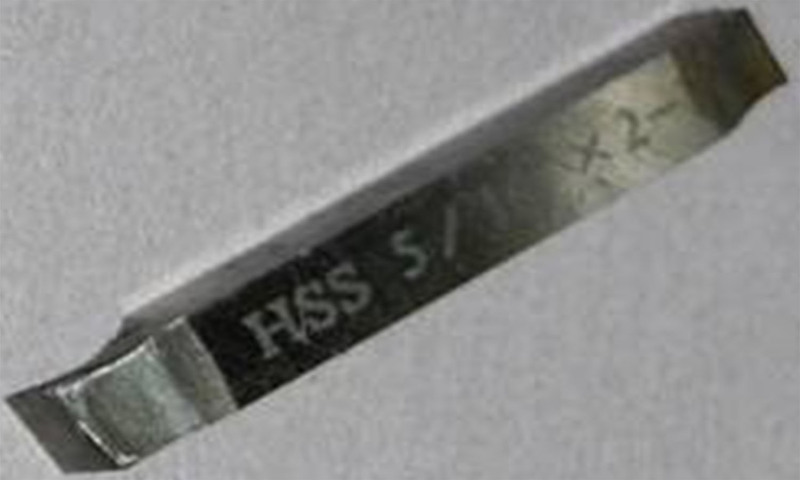 A highly tough variety of HSS known as Vanadium HSS, Carries 2% Vanadium, 6% tungsten, 6% Molybdenum and 4% Chromium. These carbides are formed by the mixture of tungsten, titanium or tantalum with carbon. The carbides, in powdered form are mixed with cobalt, which acts a binder. Then a powder metallurgy process is applied and the mixture is Sintered at high pressure of 1500 kg per sq. cm to 4000 kg per sq. cm and temperature of over 15000C, and shaped into desired forms of bits. These carbides bits are then brazed or fastened mechanically (clamped) to the shank made of medium carbon steel. This provides an excellent combination of an extra hard cutting edge with a tough shank of the tool. 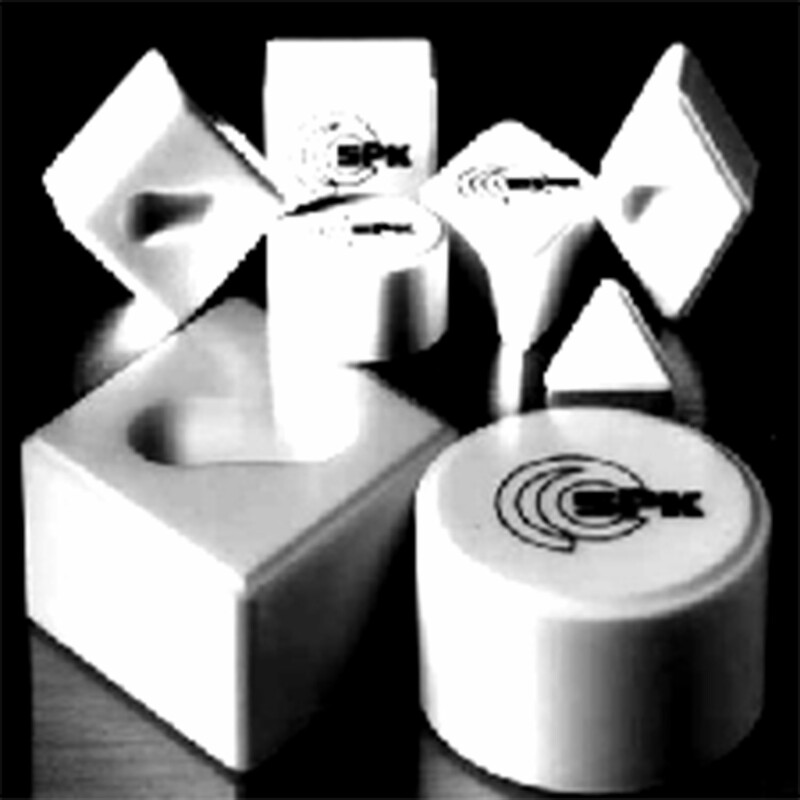 These cemented carbides possess a very high degree of hardness and wear resistant. Probably diamond is the only material, which is harder than these carbides. They are able to retain their hardness at elevated temperature upto 10000C. These cemented carbide tipped tools are capable of operating at speed 5 to 6 times higher than those with high speed steels. To obtain the best result with these tools the machine required to be of rigid construction and must carry high powered motor so that higher cutting speed can be employed. It is non- ferrous alloy consisting mainly of Cobalt, Tungsten and Chromium. Other elements added in varying properties are Tantalum, Molybdenum and Boron. It has good wear resistance and retains its hardness at red heat upto about 9200C. Because of this property, it is used for machining materials like hard bronze and cast and malleable iron, etc. 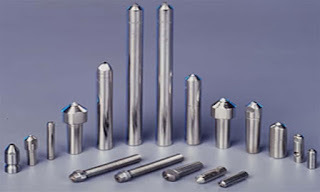 Tools made of stellite are capable of operating at speeds upto 2 times more than those of common high speed steel tools. Stellite does not respond to the usual heat treatment process. Also, it cannot be easily machined by conventional method. Only grinding can be used for machining it effectively. A satellite may contain 40-50% Cobalt, 15-35% Chromium, 12-25% Tungsten and 1- 4% Carbon. The introduction of ceramic material as a useful cutting tool material is a latest development in the field of tool metallurgy. It mainly consists of aluminium oxide, which is comparatively much cheaper than any of the chief constitution of cemented carbides. Boron Nitride powder and aluminium oxide powder are mixed and sintered together at a temperature of about 17000C. They are then compressed into different shapes of bits. Tools made of ceramic material are capable of withstanding high temperature, without losing their hardness upto 12000C. 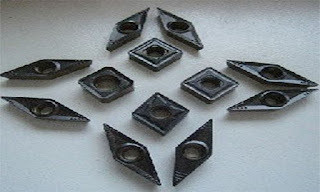 They are much more wear resistant as compared to cemented carbide tools. But, at the same time, they are more brittle and possess low resistance to bending. Due to this property they cannot be employed for rough machining work and in operation where the cut is intermittent, however, their application for finishing operation yields very satisfactory results. Under similar conditions, the ceramics tools are capable of removing 4 times more material than the tungsten carbide tools with a consumption of 20% less power than the letter. They can be safely operated at 2-3 times the cutting speeds of tungsten carbide tools. 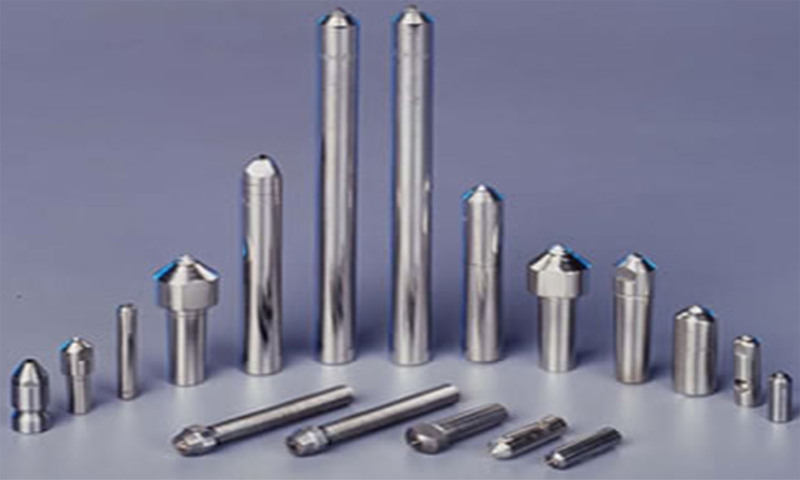 Ceramics tool materials are used in the form of bits which are either brazed to the tool shank or held mechanically like cemented carbides bits. Specially designed tool holders are also used for holding these bits. Usually no coolant is needed while machining with ceramic tools. Diamond is the hardest material known and used as cutting tool material. It is brittle and offers a low resistance to shock, but is highly wear resistant. Due to these factors diamonds are employed on lathe machine for only light cuts on material like Bakelite, Carbon, Plastic, Aluminum, and Brass, etc. These tools produce a high grade of surface finish. However, on account of its excessive high cost and the demerits, narrated above, they find only a confined use in tool industries. They are used in the form of bits inserted or held in a suitable designed wheel or bar. (a) Hot Hardness - The material must remain its hardness at elevated operating temperature. (b) Wear Resistance - The material must withstand excessive wear even though the relative hardness of the work materials changes. (c) Toughness - The term “Toughness” actually implies a combination of strength and ductility. The material must have sufficient toughness to withstand shocks and vibrations to prevent breakage. (d) Frictional Coefficient - The frictional coefficient of the tool must remain low for minimum wear and reasonable surface finish. (e) Cost and Easiness in Fabrication - The cost and easiness of fabrication should be within reasonable limits. (a) Work Material - The physical and mechanical properties of the work material influence the tool life to a large extent. Harder and work hardenable material give rise to higher cutting forces. The radial and axial components of cutting forces are influenced by work material because of the tool chip interface friction and built-up edge formation. This causes the tool getting blunt frequently. (b) Cutting Speed - Experimental studies have revealed that at lower speeds more cutting force will be required and at higher speed less cutting force will be required. At lower speed due to rise in cutting force the tool gets blunt faster. (c) Feed Rate - The feed rate has got the highest influence on the tool life. If the feed rate is high the tool will be affected by higher cutting force as a result the tool wear will be faster. (d) Depth of Cut - With the increased depth of cut the cutting forces on the tool cutting edge will be more which will cause tool wear at faster rate. (e) Tool Geometry - With the variation of side rake angle from positive to negative increases the friction in the tool-chip interface. In this case tool wears faster resulting in rubbing action and spoiling the surface finish. (f) Tool Material - Tool material plays a vital role in tool life. As discussed earlier the tool material should posses three main properties for its better life. These properties are wear resistance, toughness and hot hardness. If any of these properties are not available the tool life will be shorter. (g) Cutting Fluid - The property of cutting fluid is to reduce the heat generated during the cutting operation. If the proper flow of cutting fluid is not applied the heat generated will not be dissipated and the tool will lose its hardness due to more heat. This will cause the faster tool wear. (a) Tool Life - The longer tool life, it enables at a given cutting speed, the better is machinability. (b) Surface Finish - Surface finish is also directly proportional to machinability, i.e. the better the surface finish the higher is the machinability. (c) Power Consumption - Less power consumption per unit of metal removal indicates better machinability. (d) Cutting Forces - Lesser amount of cutting force required for the removal of a certain volume of metal or the higher the volume of metal removal under standard cutting forces the higher will be the machinability. (e) Shear Angle - Large shear angle denotes better machinability.